We are back from a New Year's break and heating up the oven again. Our 86 year old, original Italian brick oven is set for 350 degrees and is ready for another year of use. "She" has seen a whole lot of years and amazingly remains tried and true to our bakers. As an original piece of equipment, built right into the bakery, she is unmovable and steadfast. Her early years called for coal. Second generation recalls bringing up the coal buckets and "feeding" the fire before going to school each day. Eventually she was converted to gas. She has seen a few new thermostats and new Italian bricks in her hearth but for the most part, she stands proudly in her place just like she did in 1930. 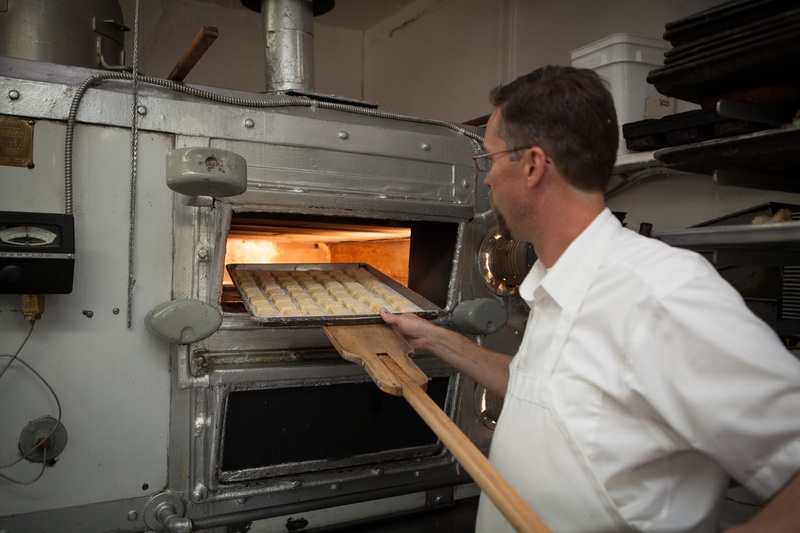 For more than eight and a half decades, there has been a fire in her belly and a warmth in her hearth with which she greets our bakers each day as they begin their work. We return to normal business hours on Thursday 1/7/16 6am-6pm, and so she is ready to go for another work day. Anxiously awaiting the first baker in, she is literally and figuratively radiant and "aglow". Indeed, her heat is on!